*Terms and conditions apply. One voucher per household + not if discounts/offers have been applied previously. Price guarantee applies to like for like services and products. Could do better? 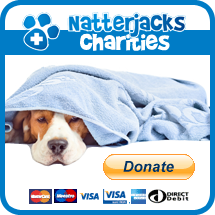 Please email confidentially to admin@natterjacksvet.com, all feedback is really appreciated so that we can continue to improve and exceed your expectations. This is your practice, shaped by you – we wouldn’t be here without you and we need you to help shape our future as well as yours!